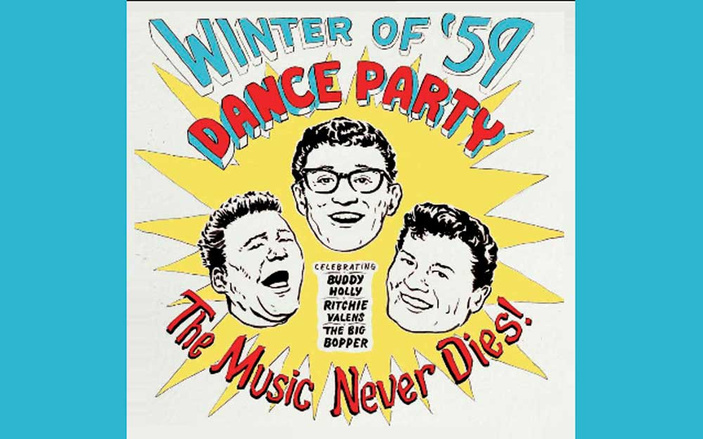 The Winter of ’59 Dance Party starts at 5 p.m. Feb. 4 at the Globe Theatre in Bertram. Admission is $15. Go to globetheatretx.com. BERTRAM — When an Iowa plane crash on Feb. 3, 1959, took the lives of Buddy Holly, Ritchie Valens, and the Big Bopper, it also killed some of the roots of rock ’n’ roll. Despite their young age, the three musicians cast a long shadow on rock that remains today. But even with their impact on music, people sometimes forget. That’s why the Globe Theatre is rekindling the men’s music and legacy with the Winter of ’59 Dance Party on Saturday, Feb. 4. The three men had just started a 24-city tour called “The Winter Dance Party” when they died. Dion and The Belmonts were also on the tour, but none of them were on the small Cessna plane that took off in a snowstorm and crashed. The festival starts at 5 p.m. with a classic car drive-up followed by the screening of the 1956 movie “Rock, Rock, Rock.” The black-and-white film features performances by Chuck Berry, LaVern Baker, Teddy Randazzo, the Moonglows, the Flamingoes, and the Teenagers. It tells the story of a teenage girl whose dad won’t buy her a strapless gown for the prom. She sets out to raise the money herself. The live musical tribute to Ritchie Valens, the Big Bopper, and Buddy Holly follows at 8 p.m. Rian Castillo will perform Ritchie Valens’ songs, Steve “Big Anton” Raby of Big Anton and the Alley Cats will perform the Big Bopper’s tunes, and Brent Wilson will bring Buddy Holly’s music to the stage. The musical tribute includes an open dance floor. Concessions and beverages will be available and Locals Neighborhood Grub food truck will be on hand selling pulled pork, tacos, burgers, brisket nachos, and more all night. While the era ushered in by Buddy Holly, Ritchie Valens, and the Big Bopper (J.P. Richardson) is gone, Regier said the music and culture still mean a lot to the people who grew up during that time and can even connect with people who didn’t. “I think as Baby Boomers are entering into the retirement years, they are looking for ways to enjoy their time,” he said. “What better entertainment than trips down memory road to the music and movies they grew up with. “Also, the early days of rock ’n’ roll represent youth and simplicity. What could be more timeless than that?” Regier added. Tickets are $15 at the door or at globetheatretx.com. All ages are welcome, but those under 18 must be accompanied by an adult. The Globe Theatre is located at 132 W. Vaughan St. in Bertram.